The upgraded port of Guam had 4.6 acres added to its container yard. With recently completed improvements, Guam port now has an improved gate area. Under federal program, the port of Guam breakbulk yard has been expanded by 10 acres. Infrastructure improvements completed at the port of Guam will provide access to electricity in case of an outage. The U.S. Department of Transportation’s Maritime Administration recently announced the completion of the Guam Commercial Port Improvement Project. The $50 million project, administered by the Maritime Administration (MARAD) on behalf of the Department of Defense, has transformed Guam’s strategic commercial sea port into a world-class facility ready to meet the demands of the future. The project was funded through the fiscal year 2010 Supplemental Appropriations Act, which authorized DoD to finance the port improvements. Completed on time and under budget, the upgraded port now has 4.6 acres added to its container yard, providing the facility with an increased capacity for stacking and storing ship containers. The port also has an improved gate area, which will increase the efficiency and speed of cargo moving through the port. In addition, the port breakbulk yard has been expanded by 10 acres, which will allow greater capacity of cargo. Infrastructure improvements completed on the electrical load center at the port will now provide access to electricity in the event of a power outage. “As Guam’s only commercial port, these facilities are key to unlocking a more prosperous future for the people of the territory and the whole of the Western Pacific Region,” said U.S. Transportation Secretary Anthony Foxx. The Port of Guam, originally constructed in the 1950s by the U.S. Navy, and transferred to the government of Guam in the 1960s, has remained largely unchanged since construction. Since the Port is a vital asset to the economy of Guam, modernization was needed to improve facilities and relieve port congestion. The Port of Guam Improvement Enterprise Program was created to provide for the planning, design, and construction of projects for the Port of Guam to increase capacity, relieve port congestion, and provide greater access to port facilities. 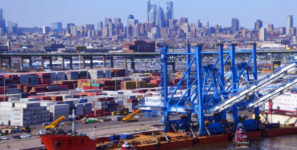 Under the program, MARAD provides federal oversight and coordination of the port upgrades.